We, GSK Finland's employees, are fundraising money for Save the children/Pelastakaa Lapset Ry as individuals and teams. We set ourselves courageous challenges and aim to outdo ourselves. Before carrying out the challenge, we ask our friends and family to donate to our collections. GSK matches the collected amounts. After we have collected the targeted amount, we will carry out our courageous acts! James' Challenge: I am doing a mix of running and swimming around a 15km route off the Western edge of the Aaland Islands on September 22nd. The swimming is in open sea water with average temps around 10 degrees and the whole thing takes just under 4 hours. 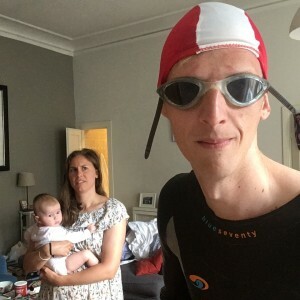 Given my minimal training and total ignorance of open water swimming my main aim is survival, but it would be great if I could also raise a bit of money for Save the Children as well. Especially if it’s the last thing I do! -- In 2013, GSK and Save the Children formed a ground-breaking five-year partnership combining Save the Children’s global reach and experience, with GSK’s innovation, resources and expertise. The purpose of our shared value partnership is to help save the lives of one million children by tackling preventable under five child mortality. In 2018, the partnership continues with the second five-year period.